Sorry to bum you out, but sushi isn’t healthy, at least at American restaurants. I know! I’m sorry! I love it, too! I mean, I super love sushi. The fish, the sauce, the little crunchies. Om nom nom. But there’s the IDEA of sushi as being healthy (because it’s fish, right?! ), but then there’s the reality, which is restaurant sushi. And the reality really bums me out, man. But I can’t just like…not tell you, ya know? Okay, so last week in chiropractic school, Frank had to fill out his intake forms to receive chiropractic care in the student clinic. He came home and told me that there was a blank that asked you to list all the junk food you eat…and you know what he put? Some rice vinegars contain high fructose corn syrup. Some. Not all. But it’s hit or miss when you’re eating out. You can bet your bottom dollar that the rice at restaurants is not organic. Not *such* a big deal to some people, but the quantity might be of concern to some. There are about 2 CUPS of rice PER roll! Yeah! Surprise! You’re eating a ton more rice than you thought! For some people We didn’t realize this until we started making sushi at home, and the recipe called for 2 cups of rice on a single piece of nori. Wowza! Did you know that iodized (table) salt more often than not contains aluminum? Aluminum can do serious damage to the body, which I detail in this post about cookware. Besides the fact that 94% of soy in the U.S. is now genetically modified, even organic soy should be fermented for optimal digestion. We use this brand of organic soy sauce. Tempura batter is typically made from flour and cornstarch. For those of you who are gluten-free, I know you avoid this already. But for those of us who aren’t, regular ol’ flour ain’t so good for you, bubs. Read the book Wheat Belly, and you’ll know what I mean. Wheat today just isn’t the same as it was 100 years ago. Not even remotely the same. And our bodies can’t digest it well. Don’t even get me started on the cornstarch! With 88% of corn being GMO in this country, you can pretty much guarantee that unless it says “organic,” it’s not! What about the oil they FRY the tempura in? Oh boy. I’ll bet you $100 it’s either canola oil (90% GMO), cottonseed oil (93% GMO), or soybean oil (94% GMO). Corn oil is also 88% GMO, so fo’getaboutit! Anything fried is just asking for GMOs. I’m not telling you never to eat tempura again. I’m just saying be aware!! This is a biggie. Unless you’re at some fancy restaurant that advertises they use wild-caught fish, you can guarantee the fish you’re eating is farm-raised at American restaurants. Farm-raised fish are fed GMO corn and soy, and they receive antibiotics in their feed. Did you know that farm-raised salmon is actually GRAY in color? They feed them canthaxanthin or astaxanthin to actually DYE their meat pink. Read more here. Food coloring is found in more than just the meat. It can also be found in fish eggs. Red, blue, green, and even fluorescent dyes are often added to fish eggs to enhance color or translucency. Imitation crab is exactly that: imitation. What it really is is all the leftover ground up bits of fish nobody wants, which are then frozen, grated, mixed with starch and flavorings, and then flattened into a sheet, dyed with red food coloring on one side, and cut into thin strips. YAH. Ginger, usually a fabulous health food, is tainted when it comes to sushi-eating. Pickled ginger is traditionally made with rice vinegar, sugar, and salt. But that pink sushi-ginger is “sugar-free”—made instead with aspartame—and dyed with food coloring to make it pink. Ginger is naturally golden. Wasabi is a root that is in the same family as horseradish, but distinctly different. It is hard to grow, which makes it expensive, so the green “wasabi” paste you’re used to eating at sushi restaurants is actually a combination of horseradish, mustard, starch, and food coloring. 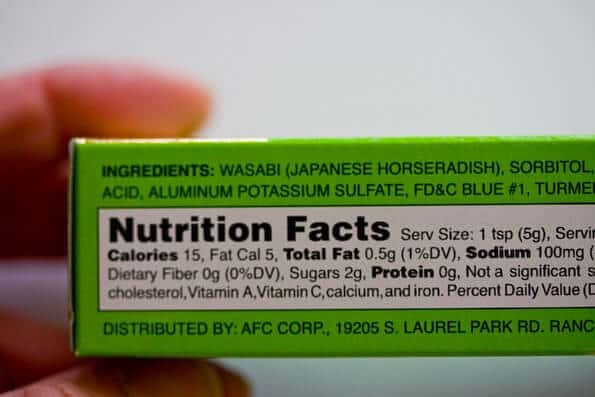 Even if the wasabi paste actually contains Japanese horseradish, it often contains other additives to make it cheaper, including sorbitol (known to have a laxative effect and made from GMO cornstarch) and aluminum. I’m not saying never eat sushi at a restaurant again. Heck, Frank and I go on a sushi date every few months. I’m so glad to live in Australia that’s for sure. Just looking at those pictures of sushi they look like they are terribly unhealthy. They aren’t normal looking sushi at all. For me, I never ever eat Sushi that is fried, with tempura, or with soy sauce. The only Sushi I ever eat is Rainbow Roll, Cucumber Roll and Salmon Roll. So I was wondering if you believe that doing that is more healthier. btw, I am from Canada and still live in Canada so I am not sure if Rainbow Roll is made the same way in Canada as it is made in the U.S.
Wow, so sad! I thought I was really eating healthier too! Not with the fried stuff obviously, but the rolls that are just rice and veggies and/or fish, I thought I was doing good! I have been feeling so lost lately. There is so much info out there that brings down everything that we use or consume. It really is depressing, thinking that no what you do, yore always in the wrong because of the way everything is processed!